I would follow Uvi Poznansky anywhere, and, joy! Now she's written a World War II thriller intertwined with an unusual, powerful love story. 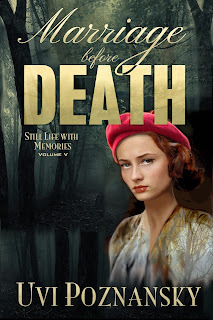 Marriage Before Death is the fifth in the author's Still Life with Memories series about Lenny and Natasha Kaminsky, war heroes. I've loved every one. Lenny, in the present, is remembering the couple's terrifying time in France, in 1944 in the long weeks before D-Day. Lenny's pain is that Natasha now is suffering from Alzheimer's. He tries to get her to remember when they were separated for a time: he was caught out of uniform and facing execution by the Germans; Natasha had disappeared into the French Resistance to help both the Resistance and the Allies. The story of how they survived such horrors is extraordinary. Also extraordinary is the author's deep and gorgeous writing, interweaving desperation with descriptions of "beautiful light streaming from high-arched, stained glass windows, rattling in the duel between the German artillery and ours." These are the memories that Lenny aches to remember with Natasha, as her disease intensifies and she struggles against it. In so many ways, our inner wars are so much more painful than any "outer" war, and this is the core of what readers feel as this story unfolds. I truly loved this story and recommend it - and the whole Still Life with Memories series. Five stars!